On Gilded Pond is a painting by Judith Hall which was uploaded on January 15th, 2010. This limited edition etching has been hand signed by the artist and it is number 14 of 275 available prints. To further enhance the beauty of this magnificent etching the border has been embossed with a flower theme. 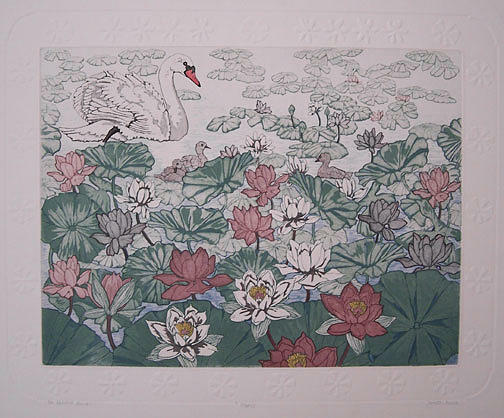 WOW, if you have not seen the embossed borders of a Judith Hall print, they really are beautiful! If you would like to see additional pictures of this etching then please email me and I can send you some. There are no comments for On Gilded Pond. Click here to post the first comment.